To celebrate the new domain www.thenordicfit.com, I'll post a fall-inspired look I had on me last week. The temperature was around 13 Celsius and this was a pretty good fit for the weather I think. Almost the same as what I posted a few days ago, this one is a little better presented and a tad easier to break down. 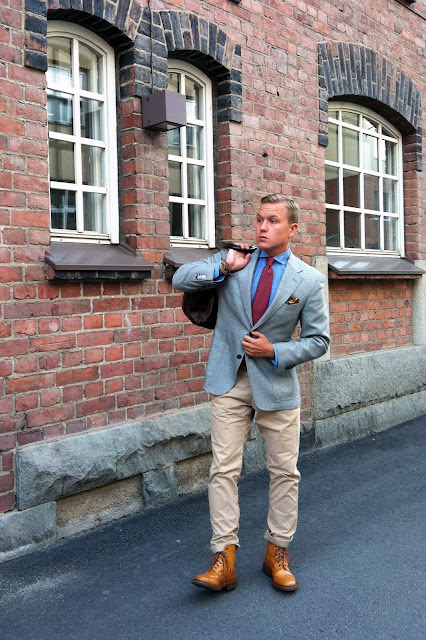 A light grey wool jacket like the one here is a perfect fall and winter jacket. Warm enough to survive till around zero Celsius and goes well with almost any kind of colors. The patch pockets and semi-soft shoulder keep the overall look casual yet sharp. 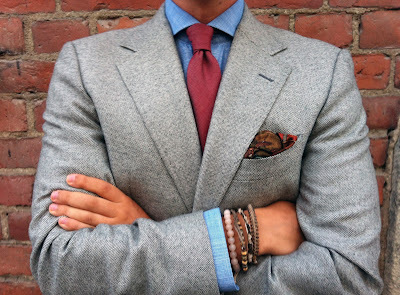 Blue houndstooth shirt adds texture, and the wide-spread collar also compliments the overall look. The red silk tie is also the same as before, but works here like charm. Too many patterns tend to make many combinations (just have a look on any fashion brand's look book, or just walk to your closest Stockmann or Barney's) look messy and frankly quite hideous, where as plain colors with interesting textures please even the most demanding eye. Here I've used only one pattern, but the "soft thick wool texture" on the jacket and the rough silk of the tie keep things popping without making you look dizzy. The pocket square is a real keeper, a wonderful Polo Ralph Lauren vintage print silk square with very nice textures, and perhaps demands a post of its own later on. Here it adds some nice color in fall theme. Especially love the hint of bright dark red. 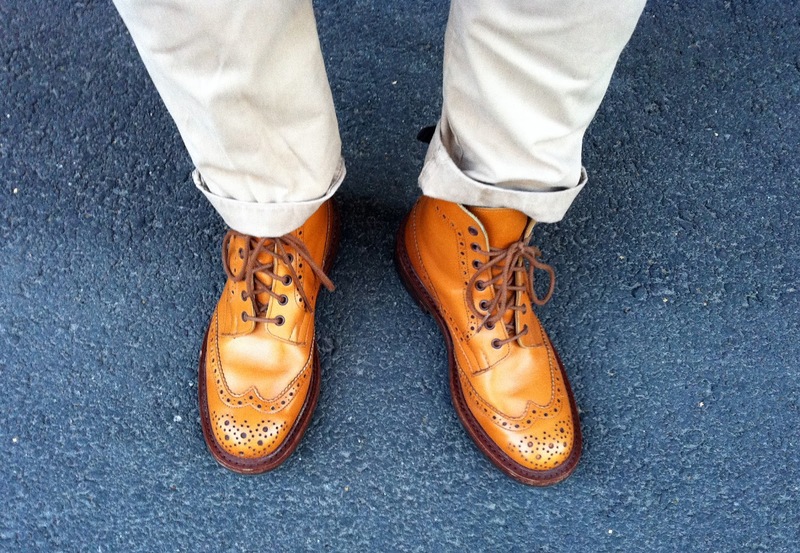 The boots are my Tricker's country brogue boots again. I love the color, and they fit my feet like a dream. So comfortable, warm but not too warm and the Dainite rubber soles give you the comfort of mind - even if it happens to rain. The semi-heavy beige chinos are a safe bet here, and I could've gone with navy ones as well. Actually, I think khaki or especially camel cargo trousers might have been a nice touch here, had I wanted to go much more casual. Tags: Menswear, men's style, men's fashion, style, lifestyle, fall trends, miesten tyyli, miesten muoti, syysmuoti, syystyyli. Here in Italy (Milano) we have about 35/37 degrees! Looks fantastic. What tie knot are you wearing, may I ask? Thank you Sir! I always use a four in hand or a double four in hand. To be honest, I think anything else is rather hideous. A four in hand just gives the tie a shape that cannot be matched. Your new multi-coloured striped knit tie is sensational too. I'd chop off a finger for that tie! It sure is. Wouldn't even think of using anything else!